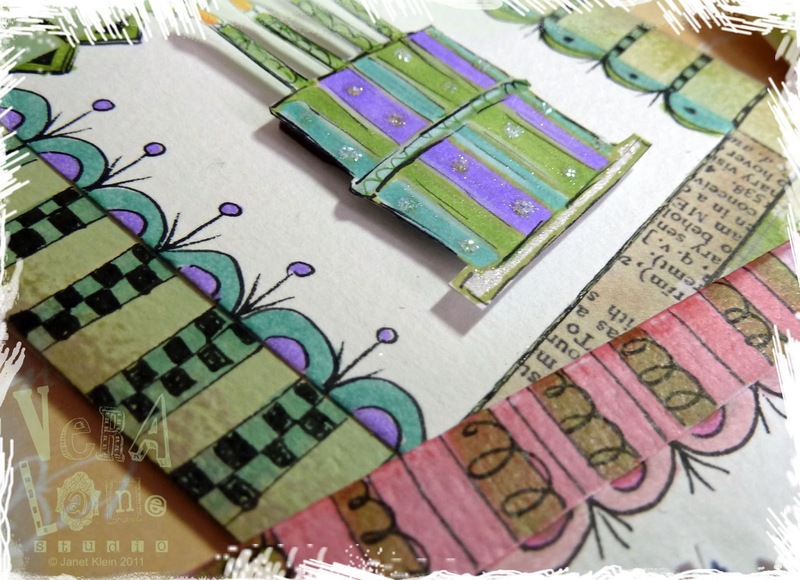 I thought I would join in on France Papillon's vintage theme this week at the Stampotique Designer's Challenge. This image of my husband's mother Leah featured in the stamp Summer of 32 really fits the request to go vintage. To begin this pin cushion I created a muslin bag that I had filled with rice. I dyed another piece of muslin with tea bags and stitched a cover for the rice filled bag. Rice makes such a nice pin cushion. I didn't want to risk ruining the fabric if my stamp was not clear, so I tore a small piece of fabric to stamp. Summer of 32 is stamped with coffee Archival ink. The image was centered on the flat and stitched in place with a sewing machine. 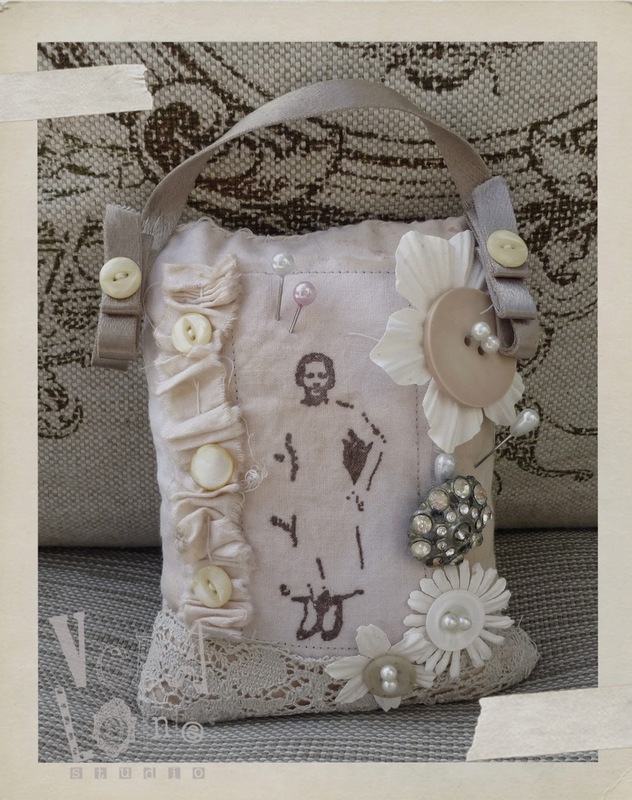 I decorated the cover with vintage trim and buttons. I tore some narrow strips of tea stained muslin and gave it a loose pleat for added texture. I decided not to dye my Prima paper flowers to add some contrast. I found some ecru satin ribbon that had a nice vintage feel. I looped the edges and stitched with buttons to add interest. The distressed vintage rhinestone button really sets the piece off. A little kitchen mishap has temporarily deterred my crafting this week so I am revisiting a series of birthday cards that I had created for a group of friends with birthdays in the same month. 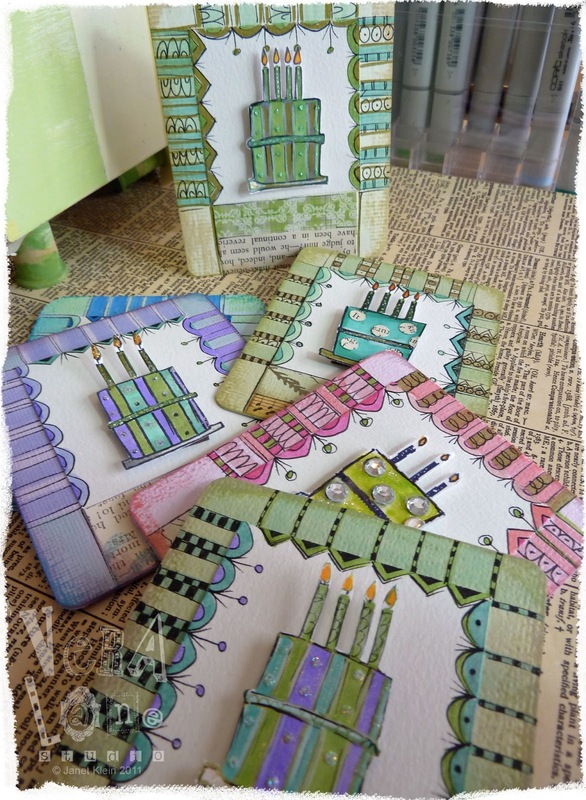 These colorful birthday cards were made with my Stampotique birthday cube with candle. I stamped the cakes and added the candles. Using Copics, hole punched text, liquid pearls, scrapbook paper and rhinestones to embellish. No two were exactly alike. I raised the cake image with foam adhesive squares and doodled frames with Pitt pen and more color. The edges of the cards were treated with Distress inks. I presented the birthday gals and guys with the cards in clear cellophane with a handful of Dove chocolates. The bags were tied with contrasting organza ribbon. The partiers were pleased with their handmade token gifts. Making several at a time made it fun to make and fun to give. If you have arrived from the Stampotique Designer's Blog you are looking for the story behind this stamp. This image comes in a few variations. Lissi , as seen above, Lissi with her little friends (large and small) and her buddy "Midge," also a stand alone image. Lissi, a dear friend of over twenty years shared her childhood photo for me to manipulate into a stamp graphic. 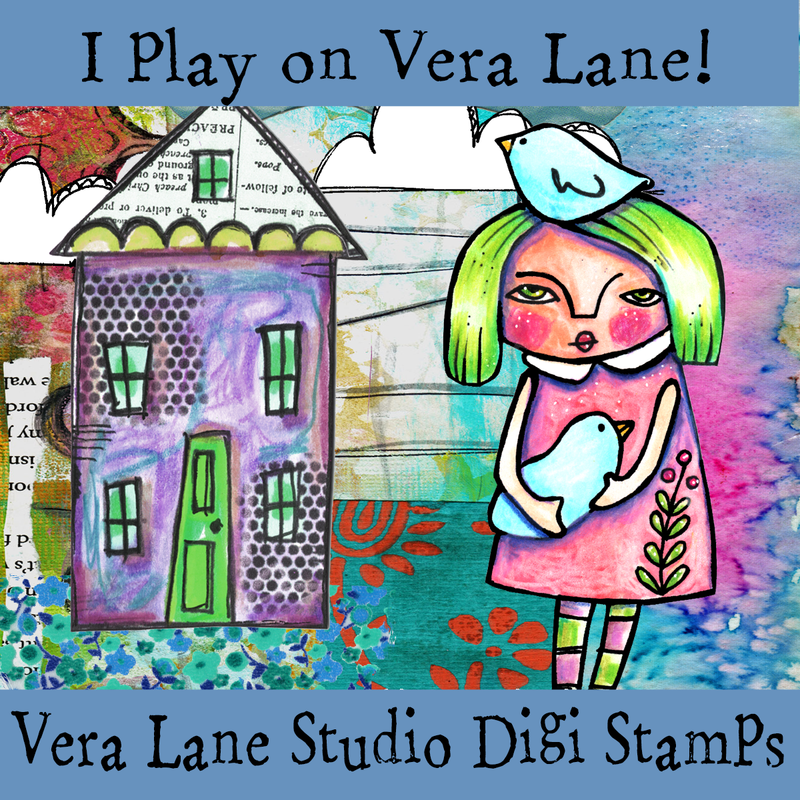 The photograph allowed me to play with the lines and contrast to make a stampable image. The story behind this stamp is not so much about the little girl, it's about the woman who has become family to me. Years ago, I found myself in graduate school working on a Masters Degree in supervision and administration. This was something my father encouraged me to do, but my heart was still in art. When I walked into my first class I saw a sea of faces that merged into one with the exception of Lissi. Lissi was flamboyant with a shot of blue-black hair. She wore a fashionable, red sweeping cape with jewelry Frida Kahlo would envy. She had a hearty laugh. I watched her across the room. As was I, Lissi seemed a little bored with the presenter, laughing and chatting with another classmate. She seemed to be a bit of a rebel and I liked that. Lissi evidently noticed me too and approached me at break. That was the beginning of a twenty-one year friendship. Lissi is a lover of the arts. Her home is a jewel in the desert of Cave Creek, Arizona. Her walls are a dance of crimson, mustard, teal, lavender, and cobalt. Her art collection reflects her world travels, but mostly her love of Mexican folk art. She is theatrical, artistic, a singer, a wife, a mother, a grandmother and a generous and loving friend to many. She even was a pilot. I became little sister. We spent a summer based in Cuernavaca, México traveling, collecting crafts and photographing our journey. It was an absolute lifetime memory and I couldn't have done the trip without her voice and guidance. Then came cancer. I didn't want to believe it was true. My friend fought her battle with so much courage and dignity. She was concerned about having her hair at my wedding and being able to dance. She did, and she did. She found her therapy and healing in stamping. Stampotique was then a shop in Phoenix. Lissi had become a regular. It is thanks to my dear friend that I have had the opportunity to work with Stampotique. We traveled to Mexico again, this time with our husbands. We each took suitcases filled with art supplies, and spent time crafting with the ocean breeze blowing into our beachfront casita. The four of us have cruised, visited wine country, dined and shared wonderful memories. A lovelier person you could not meet. Today, my dear friend fights several health challenges and never complains. She lives with pain everyday. She can no longer do her crafts, however, but still has her hearty laugh. I love Lissi. She and her husband are family to me. This stamp image is so special as it represents my friend and the joy she holds in her heart. Please say a prayer for my dear friend. 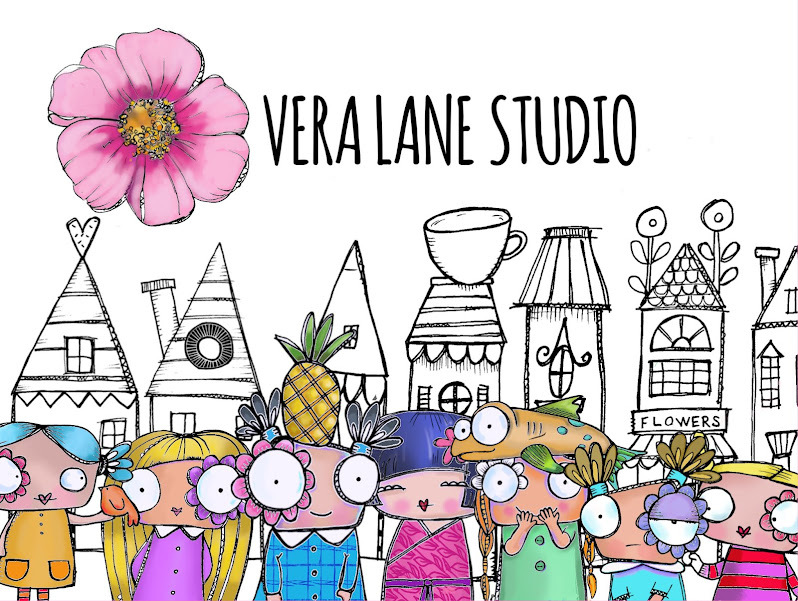 Well I have been enjoying today perhaps a little too much that I have spent very little time in my studio this week with the exception of working with my students. So here is a super fast little card that took about five minutes to make. I reused a piece of watercolor paper from a student practice of line variation with round and flat brushes. 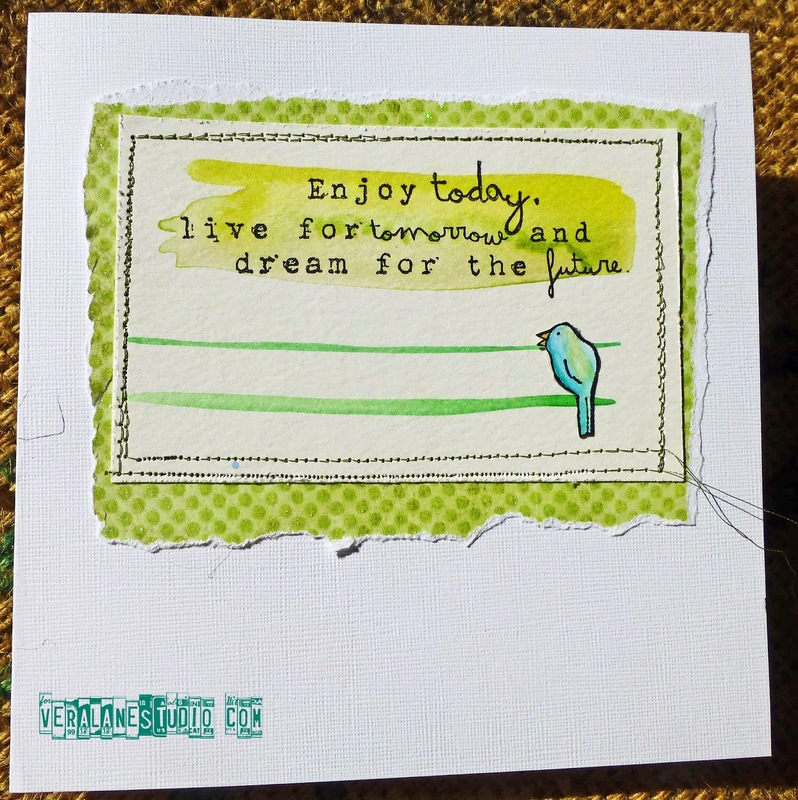 The thicker line looked like the perfect shape to layer this enjoy today quote stamp by Maria Sabina Rita. Now I needed a little image to give it some asymmetrical balance...ahhhhh...Roc's little bird snipped from her just b u image. I tore a piece of coordinating scrap paper and sewed this little puppy up with lime metallic thread. Only have five minutes? With some cool Stampotique stamps you can make a pleasing card in no time at all! It's a gorgeous day here in Arizona. We've had a rather mild winter, and after a well-needed downpour yesterday the sun is shining and the air is crisp. While friends and family are still experiencing storms and snow, nature's promise, spring is sure to follow. April can be resized for your paper craft needs. She's perfect for birthday, get well, thinking of you cards, and invites. 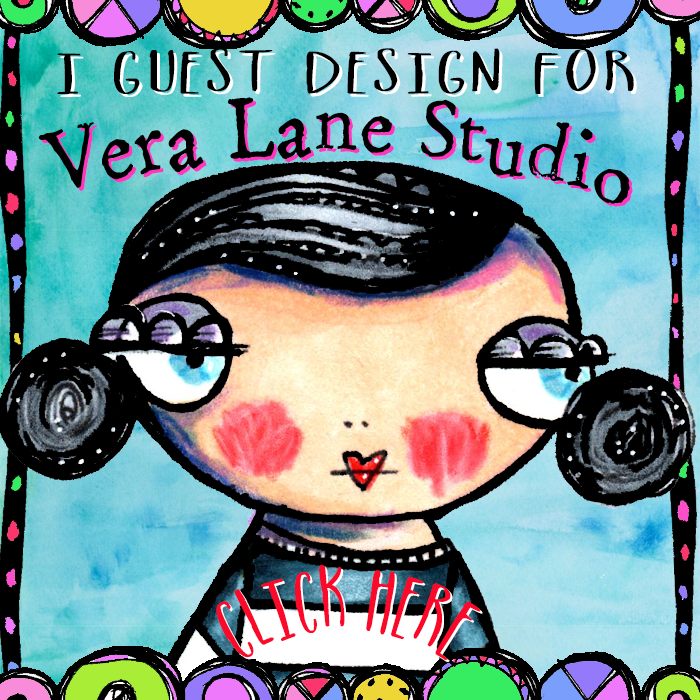 Print, color, and cut for art journals or tag art.